Israeli soldiers abducted, overnight and at dawn Thursday, at least 38 Palestinians, including 19 from occupied East Jerusalem, during massive invasions and violent searches of homes and property in several parts of the West Bank. 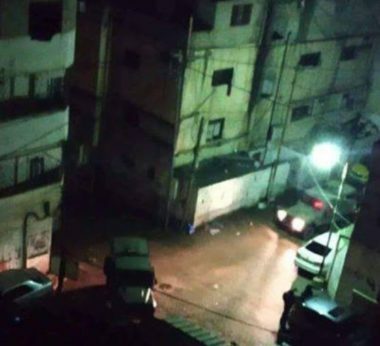 In Tulkarem, in northern West Bank, the soldiers abducted a former political prisoner, identified as Bakr Mohammad Salim Kharyoush, 27, after smashing the doors of his home and breaking into it. In Ramallah, in central West Bank, the soldiers searched many homes and abducted Omar al-Barghouthi, his brother Assef Barghouthi, and his brother-in-law, Hadi Barghouthi, in addition to Khaled Zeebar, and two former political prisoners, identified as Monir al-‘Abed and Khaled al-‘Abed, all from Kobar village, northwest of Ramallah. It is worth mentioning that Omar al-Barghouthi is the father of Saleh Omar al-Barghouthi, 29, who was killed by undercover Israeli soldiers, on Wednesday evening, in Surda Palestinian village, near Ramallah. In occupied Jerusalem, the soldiers invaded many neighborhoods before storming and searching homes, interrogated dozens of Palestinians and abducted at least nineteen young men. The abducted Palestinians have been identified as Morad Zaghari, Mohammad Dabbagh, Nafeth al-Jo’ba, Fadi al-Jo’ba, Majed al-Jo’ba, Mohammad Ghneim an-Nansh, Omar Mheisin, Khader al-‘Ajlouni, Ahmad Jaber, Amro Abu Arafa, Jihad Qous, Younes Ashour, Khader al-‘Ajlouni, Mohammad Ashour, Luay Nassereddin, Hamza Milhis, Khaled Milhis, Emad Abu Sneina and Abu Wael al-Fakhouri. In Tubas, in northeastern West Bank, the soldiers abducted Faze’ Sawafta, Omar Hamza Daraghma, and Mohammad Emad Sawafta, from their homes, and Fadi Bashar Abdul-Razeq, who was taken prisoner at the southern entrance of Jericho city. Furthermore, the soldiers abducted Ala Ibreiwish, from his home in Doura town, south of the southern West Bank city of Hebron, and Murad Yousef Salayma, 27, from Hebron city. Also in Hebron, the soldiers invaded and searched the home of Soheib Abu Jaroush, and summoned him for interrogation.